The other week, my work colleagues and I were discussing cola. It turns out it’s not something many of us in my office drink on a regular basis. But we all reminisced how, when we were younger (in the days before Diet Coke – eek I’m that old), Coke was only seen as an occasional treat. Nowadays it seems to be chugged down by the gallon load all the time by many -I know, I sound like an old disapproving moan! In the '70's I would be lucky to get a glass once a week, on Saturday lunchtime. I remember that my mum and I would visit my grandparents for lunch on a Saturday along with my aunt and cousins. My gran would give us each a modest tumbler of the fizzy stuff and if we were really lucky and the weather was hot (we did used to have summers in Scotland) we would get a coke float! I recently came across a few recipes for cakes that incorporated cola in them. I was very intrigued, and investigated more. They were all essentially a chocolate cupcake with added full-fat cola. Now I thought what a lovely pairing the chocolate and the caramel overtones of the coke would be. I decided to experiment and came up with my own version. Pre-heat your oven to 180oC and line a cupcake tray with paper liners. In a bowl, cream together the butter and sugar, until pale yellow and smooth. Next add the eggs, one at a time and beat until the batter is slightly thicker and increased in volume a little. Slowly mix in the cola until it is incorporated with the rest of the batter. 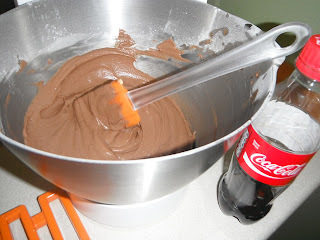 In another bowl, whisk together the flour, baking powder and cocoa powder. Now add one third of the flour to the wet batter, mix until just combined. Add half of the buttermilk, mix until combined and do the same with another third of the flour, rest of the buttermilk and finish with the last third of the flour. 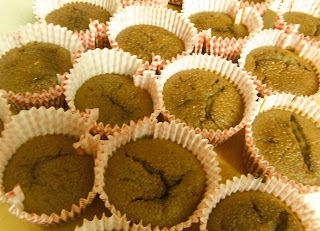 Scoop equally into 12 cupcake holders and pop into the oven for about 30 minutes or until a toothpick comes out clean from the centre of the cakes. Leave to cool completely. To make the frosting, sift the icing sugar and cocoa powder together and mix into the butter thoroughly. Add the vanilla and cola syrup, again mixing until smooth and combined. Taking a piping bag, (or a food baggy with the corner chopped off) pipe the frosting onto each cupcake in a swirl. I kept mines in the fridge to keep the frosting nice and firm. I'm always intrigued by cola recipes (including those with hams!) as I'm unable to make up my mind about them - whether they are a force for evil or not (i.e. the standard sort of cake issues I have). Yours do look lovely though and the little straw decoration is cute! Oh cola glazed ham - mmmmm! Might try other fizzy pop type cakes in future - hope I can impress you! I never tasted anything similar. I am sure it will taste very good! Thanks for sharing. 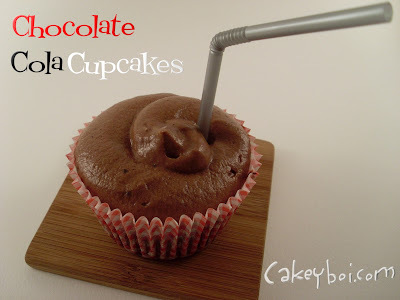 I don't drink Cola, but I love using it in cupcakes so I'll definitely try out this recipe. Great blog! Thank you - and thank you for following Cakeyboi. Let me know how your cupcakes turn out! This is popular in our house too but they insist on the cola bottle on top. Obviously not enough sugar for some ;-) Have been using Crusha too- strawberry is really good, have you tried it? Hi Mrs M - what a great idea to use Crusha milkshake syrup - I have never tried it, but can think of lots of uses! I am intrigued by these...i think im going to have to try them out!! !